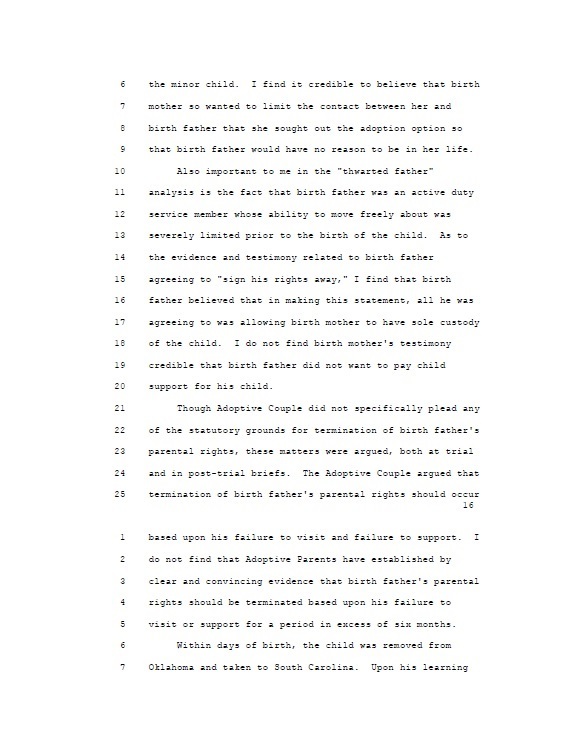 You see, the gist of what you are about to see is that according to Judge Malphrus of South Carolina in her ruling of Sept. 2011, Dusten Brown was a THWARTED FATHER. That means he was effectively opposed, that adoptive couple effectively violated his rights. It means they defeated his hopes and aspirations of being a father. They passed right over him, ignoring his rights and stealing his child with trickery of the law much like some fairy, adopto-land magicians. I realize many have been told for a long time that Mr. Brown abandoned his child and is a horrible person but that simply was not the truth. It makes the entire tragedy that has become Baby Girl’s life much more palatable if we believe this couple were SAVING her. After all, they even named their cause SAVE Veronica Rose. They are saving her right? But a deeper read and some thought lets you get a glimpse of adopto-world tactics, into what happens when an adoptive couple is so desperate to adopt that they are willing to ‘thwart’ the father to do so. They find birth mothers in unfortunate situations. They offer inducements. They get her support and permission. She often has an axe to grind with the birth father. 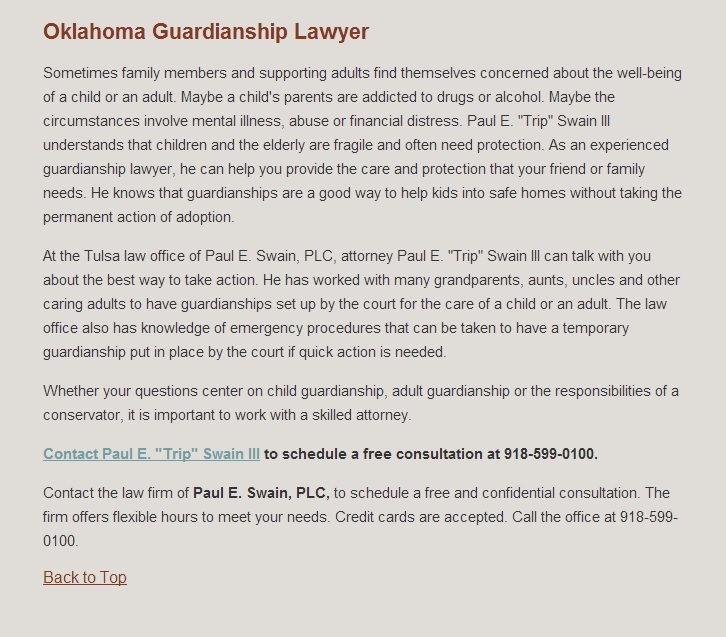 Adoptive couples and attorneys are often very eager to help birth mothers solve this little issue. They often forgo some part of the paperwork. They cut the father out of the picture. The list goes on. 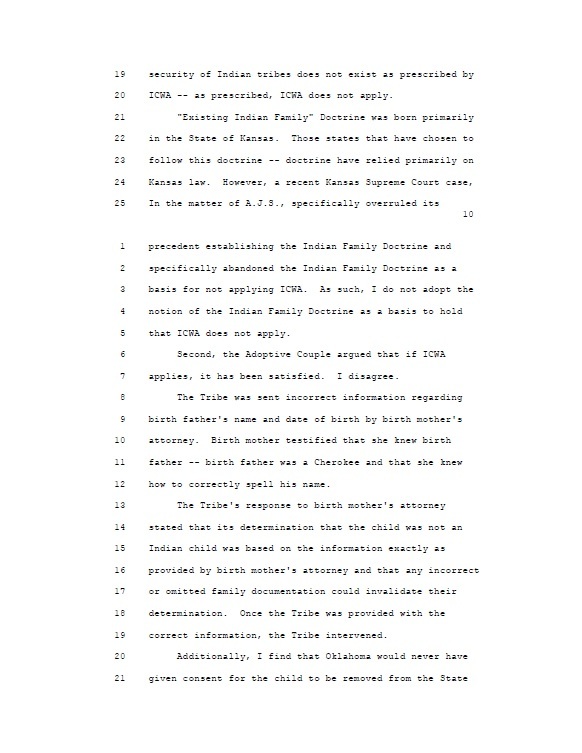 But here we see, Mr. Brown still won his case on more issues than simply ICWA. They found his rights were intact and had to be terminated first. They found terminating them was NOT in Baby Girl’s best interest. They would not terminate them. They found birth mother lied. They found adoptive couple to be untruthful when seeking to terminate his rights based solely on lack of support for six consecutive months. They found Adoptive Couple was trying to use a loophole to get around him. They found he tried to be there but wasn’t allowed to be. They found adoptive couple to be impeding contact between Mr. Brown and his daughter. But somehow, on appeal to the Supreme Court of the United States, the only issue before them was ICWA and whether that applied. 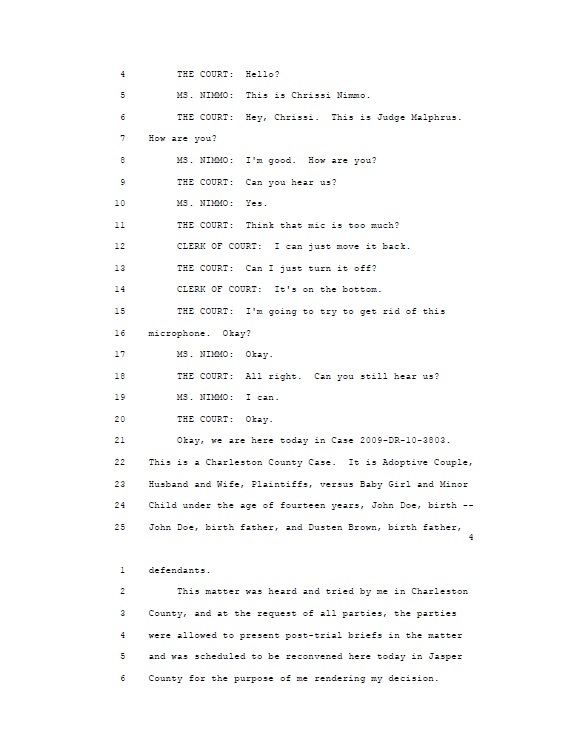 And in another unfortunate leap, South Carolina (on remand) seemed all too eager to forgo Baby Girl’s right to a best interest hearing and various other procedural safeguards and simply hand the prize over to the highest bidders, the Capobiancos. They were able to ignore every other legal ground on which Mr. Brown won his case. 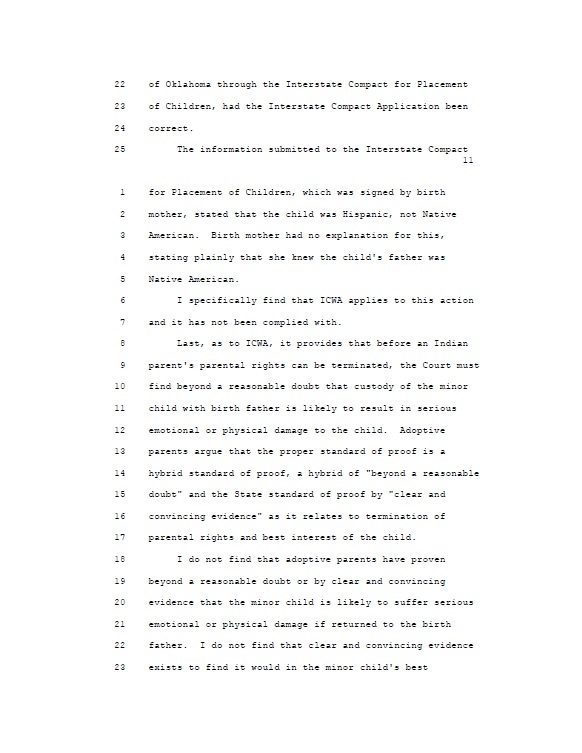 They simply said ICWA did not apply so therefore, regardless of his rights and any other legalities, these people, as well-to-do South Carolina consitituents should have his child simply because as Mrs. Capobianco stated, they wanted her more. How did we get from there to here? How can our justice system allow this to happen to a legal birth parent in this country? What if this were your father? Your son? Your child? How do we fail a child like this? I’m hoping it’s a question we all will be asking ourselves. I hope it’s something that doesn’t allow one to sleep at night. I hope it’s something that outrages others as much as it’s outraged me. I hope it’s something that compels one to scream and yell and write letters and tell the world this just isn’t even humane! Often, if we compare statements one has made at different times, we are able to detect slight differences. We can see how one’s story changes. 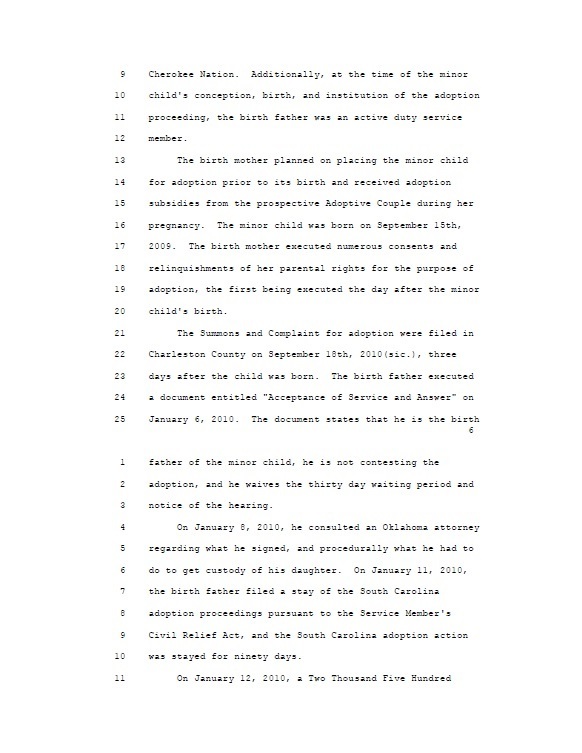 We’d like to bring you for comparison, Birth Mother, Christy Maldonado’s affidavit from the Oklahoma court case in Adoptive Couple vs. Baby Girl. At this point, after being served and finding out he had a child, Mr. Brown moved to obtain custody in the Oklahoma courts. Here you see Birth Mother’s statement at that time. 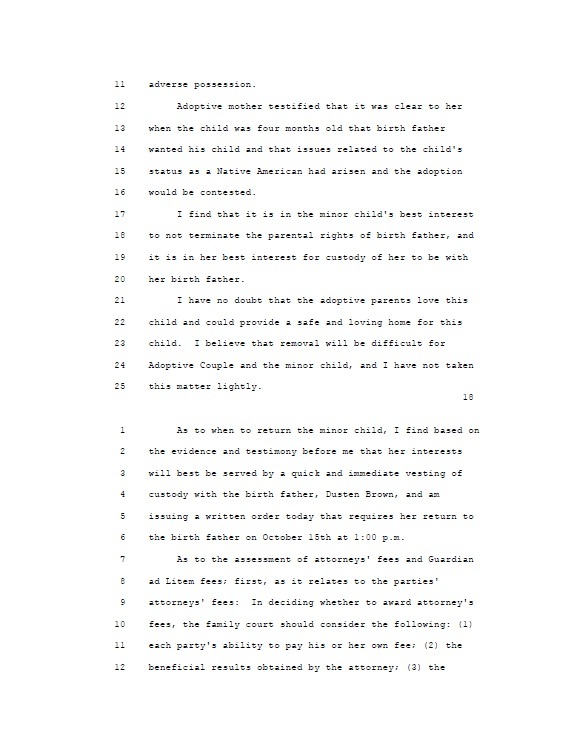 First we see from the case title “Dusten Dale Brown vs. Christinna Maldonado, Matthew and Melanie, last name unknown and Does 1-25” that Father’s testimony stating he was unaware of Baby Girl’s whereabouts and didn’t know who had her was in fact plausible. At this point, he and his attorney are unaware of the Adoptive Couple’s names other than that they are known as Matthew and Melanie. 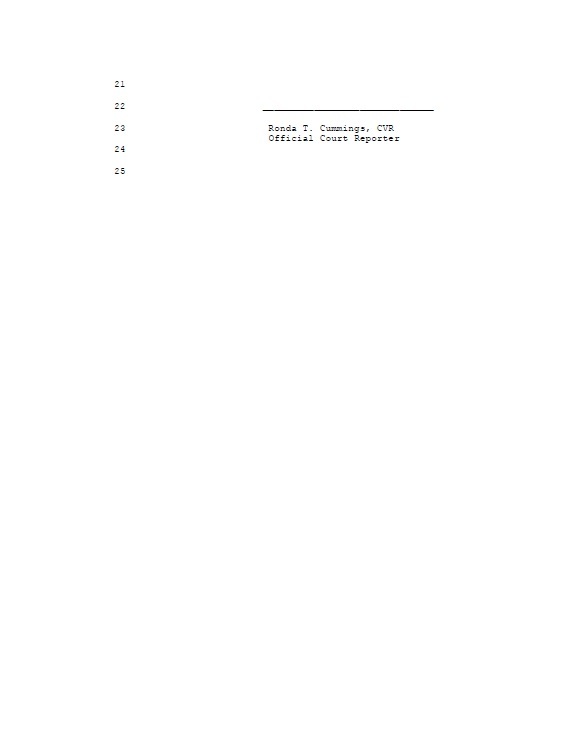 His statements in later proceedings are consistent with initial filings and the story has been consistent throughout. 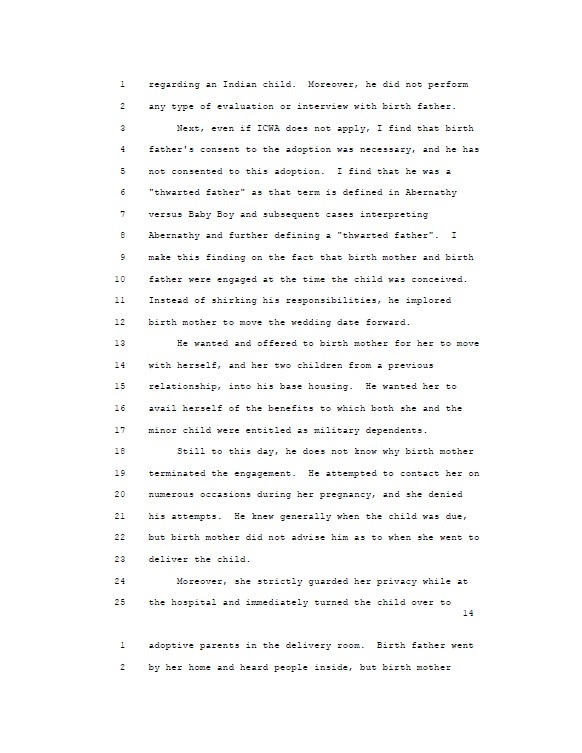 From these pages we see statement #4 conflicts with all other testimony from Birth Mother stating she had no contact with Mr. Brown during the later stages of her pregnancy. 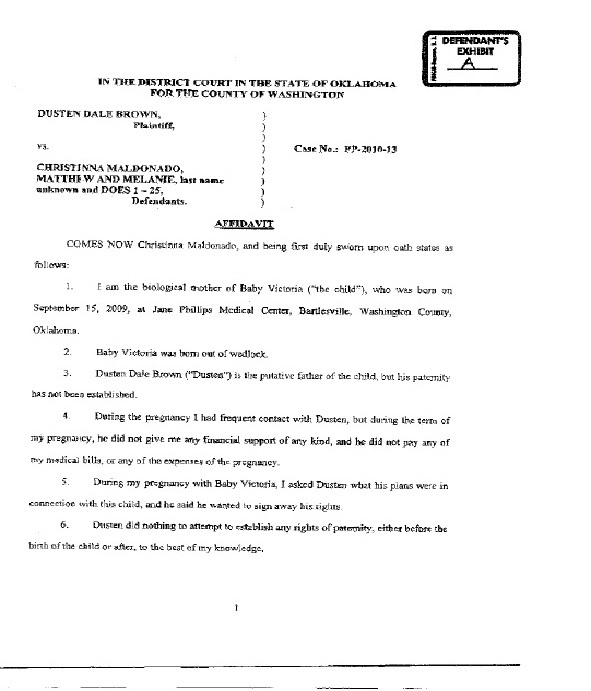 This affidavit is from an earlier time in this case. We are then led to ask ‘Well, which is the truth?’ Was she in contact with him as she states here or wasn’t she? We must wonder, was Miss Maldonado honest here but later coached as to what her statement should be in order to be more in line with Adoptive Couple’s assertions? In statement #5, she states Mr. Brown did wish to sign away his rights. But again, we see from Mr. Brown’s testimony, he used the terms ‘sign away my rights’ and ‘give custody to Miss Maldonado’ interchangeably. Could this be a rather technical sort of play on words? Could he have expressed his wish to ‘sign his rights away’ to her instead and was that left out? Many father’s also have no idea that a putative father registry exists in their state. They have never even heard of the term. With some state laws saying a prospective father must register with his state’s putative father registry before birth or within so many days of the birth, it’s often a way to subvert father’s rights rather than assure they are firmly in place. And in some cases, despite having registered, the father’s rights are still ignored. We know that the adoptive couple filed their adoption petition on Sept. 18th, 2009. 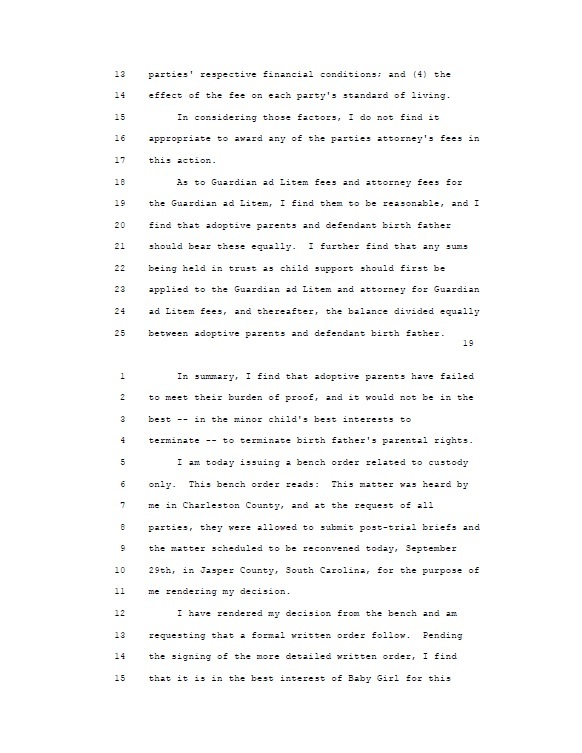 However, from statement # 8, we see that South Carolina did not approve of Baby Girl’s placement in the state until Sept. 21st, 2009. 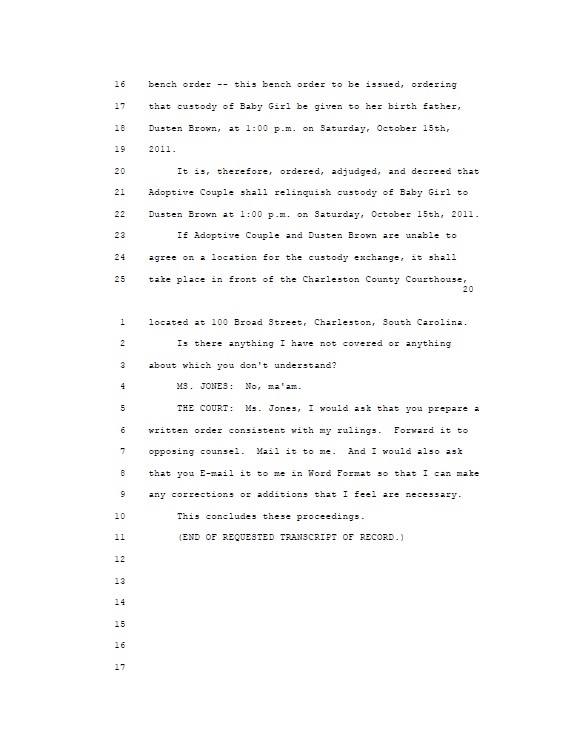 We also know that Adoptive Couple didn’t take Baby Girl to South Carolina until approximately 7 or 8 days after birth (Sept. 22-23) from Adoptive Mother’s testimony. 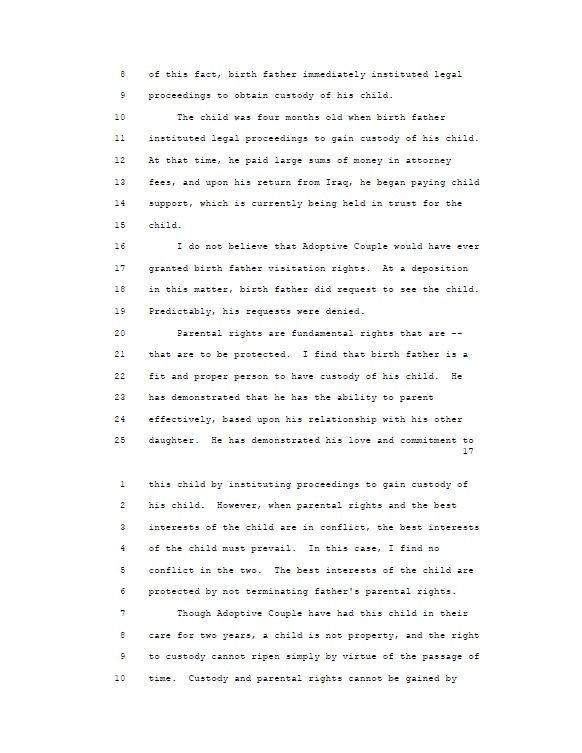 On the issue, South Carolina adoption law specifically states that the child must be present in the state at the time a petition is filed. The child need not have been born there but must be present there at the time. 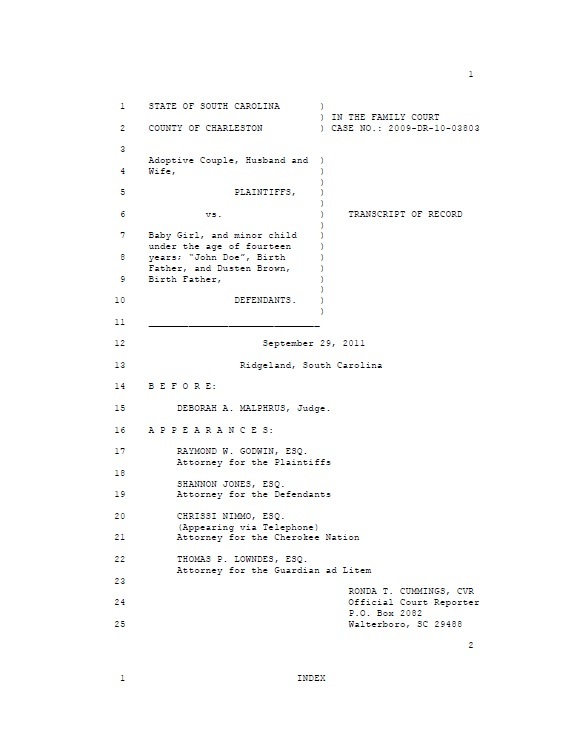 Baby Girl was not present in South Carolina at the time they filed the petition for adoption. 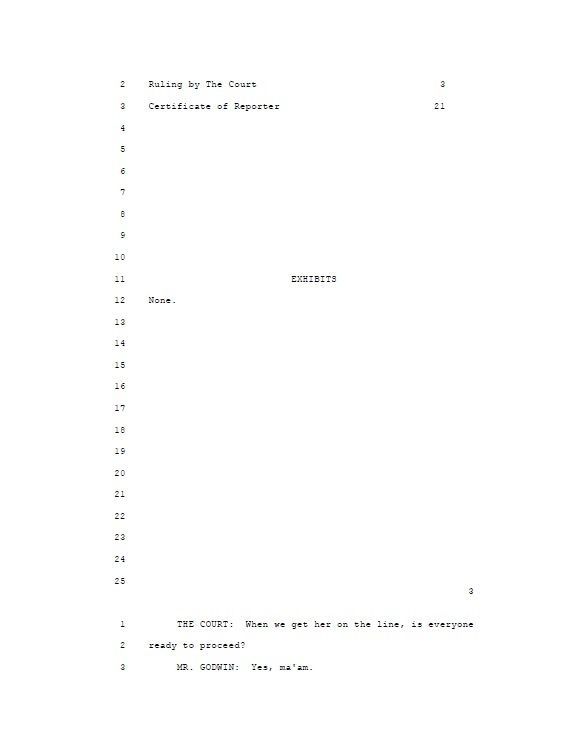 SECTION 63-9-50. Children who may be adopted. 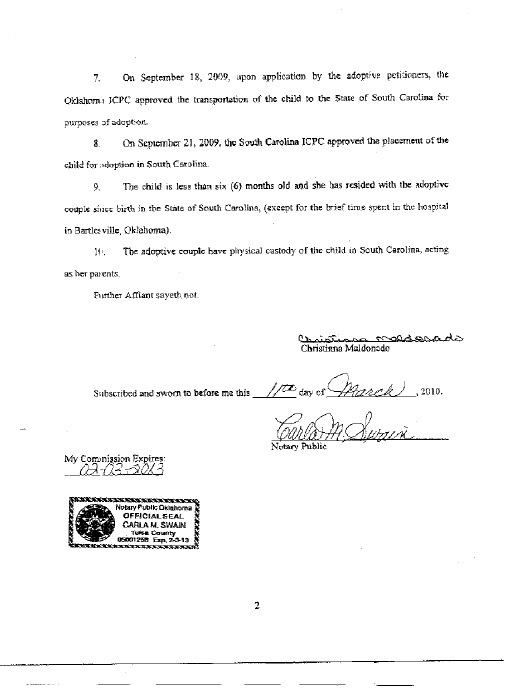 Any child present within this State at the time the petition for adoption is filed, irrespective of place of birth or place of residence, may be adopted. 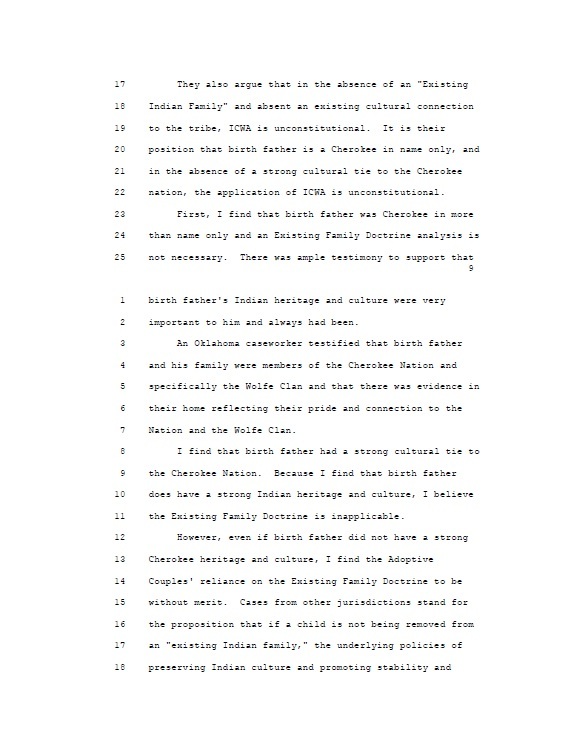 We further see from Birth Mother’s testimony, ICPC procedure was not adhered to in that the ICPC agency was not told of Baby Girl’s Native American heritage. 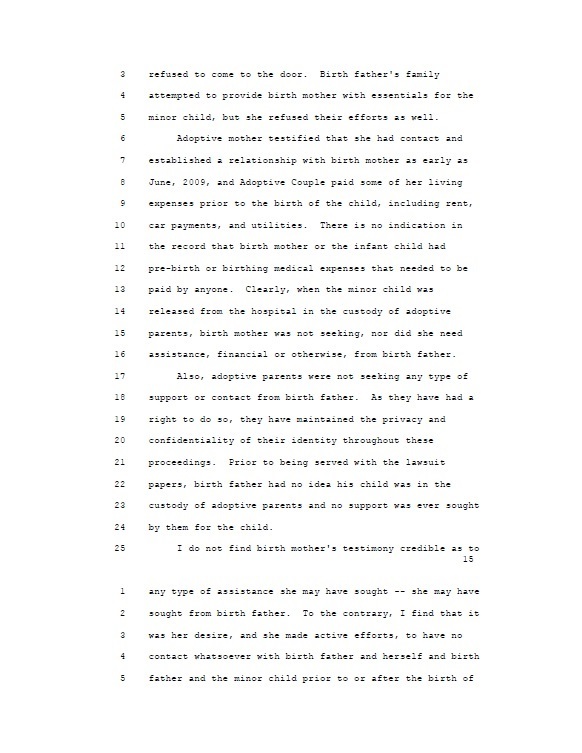 We see that birth mother states that although she knew father’s name and birth date were wrong, she did little to provide the correct information. And had that been done, then not only would Father have been notified but his tribe would also have been given the chance to intervene. 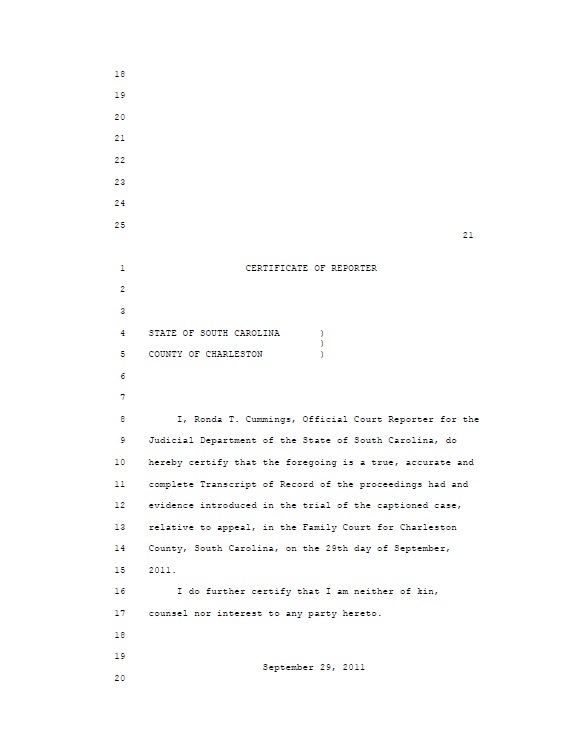 Baby Girl not present in South Carolina when the petition for adoption was filed, and when she did arrive there it was by rather suspicious means. And in #9, she uses THE most used reason in all contested adoptions… ‘but we’ve had the baby for so long, we’ve bonded and shouldn’t have to give baby back’ theory. This is almost always used in every single contested and unethical adoption in history. By holding on to baby long enough, an adoptive couple often asserts that now, after bonding has occurred, removing baby from their care would be detrimental. 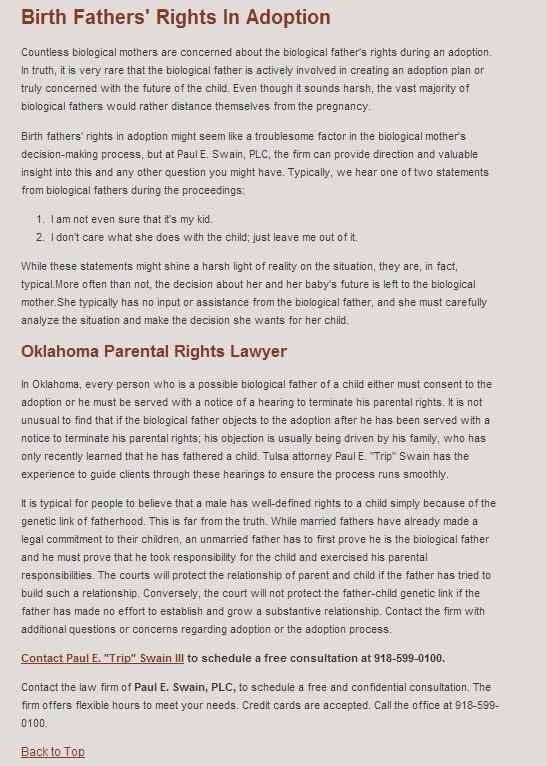 Of note though, in this case, Adoptive Couple used this theory initially but since Baby Girl has been with Father now for the past two years of her life, they now assert the opposite in stating a move now, although damaging, should still occur regardless and Baby Girl’s best interests should NOT be considered. 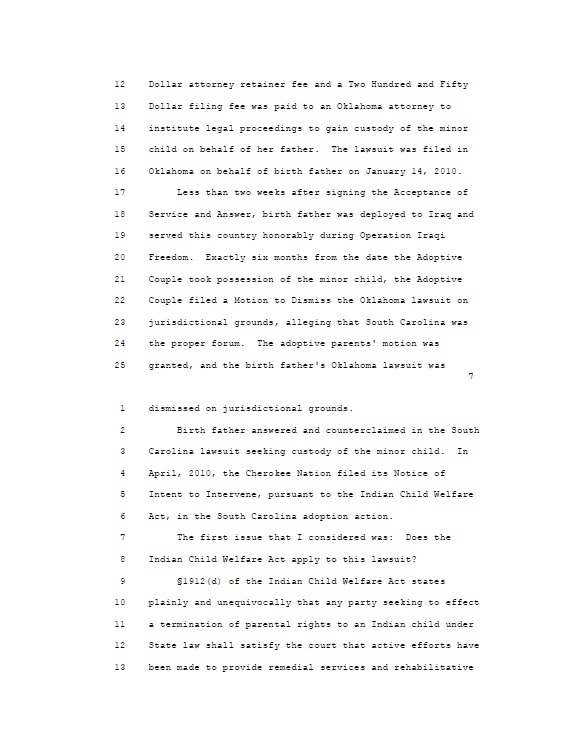 They’ve also made attempts to block the appointment of a Guardian Ad Litem in Oklahoma. 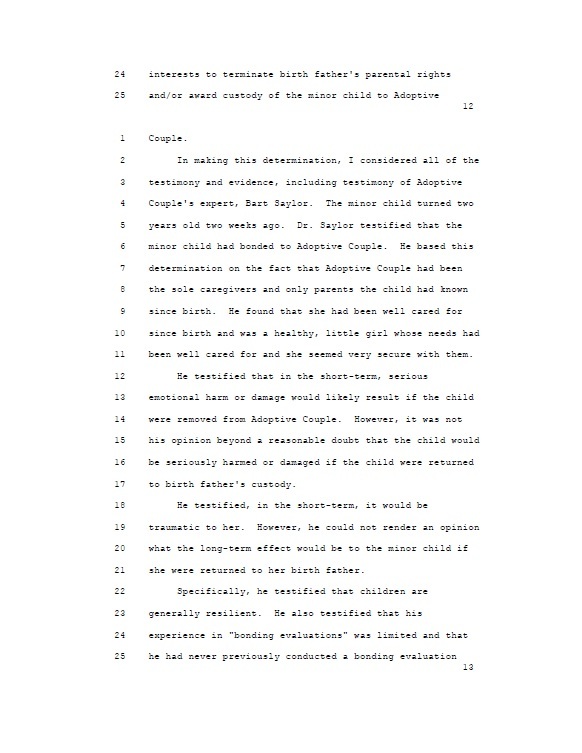 It almost sounds as if this entire thing was drafted by Attorney Paul Swain, who we know was involved not only in this case but in the Baby Desirai case as well. Mr. Swain makes sure to let the prospective birth mother know, not only can he deal with that pesky birth father issue, but even if you are a young, pregnant mother, he can deal with that too. 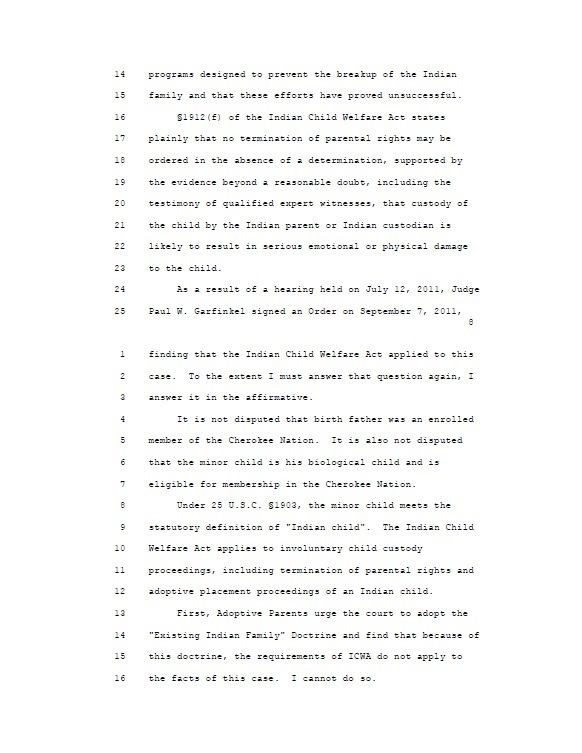 As we understand, as was allegedly done in the Desirai case, Mr. Swain can also deal with guardianship, taking custody of the baby himself in order to more expediently place baby. Pesky Birth Father you need to work around? Need to shuffle that baby off more quickly?